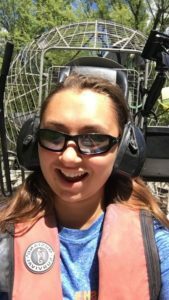 Alexis Sienczak (’18) in the DNR air boat. Alexis Sienczak (December ’18), a Biology and Geography double major, held a summer volunteer position with the Minnesota Department of Natural Resources (DNR) in Lake City, MN. She worked with the water conservation, vegetation, and fishery departments. The purpose was to collect water samples from the Mississippi River as part of the Army Corp of Engineers’ Long Term Ecological Monitoring program for the Upper Mississippi. This program has been running for 20 years with collaboration from four other states: Wisconsin, Iowa, Illinois, and Missouri. Twice a week, Alexis would boat from Red Wing to Wabasha, MN, collecting 14 water samples along the way. Measurements such as zooplankton abundance, water pollutants, turbidity, and velocity were collected at each site. After collection, the samples were filtered and transferred to the La Crosse, WI, DNR office. The best part of the internship was taking the air boat (see photo) out to do vegetation surveys near Hager City, WI. The experience taught Alexis how to ask for feedback from her supervisors as well as asking questions about careers in environmental monitoring.